My new brakes are worse than my old brakes!! All new hydraulic cylinders, rubber brake hoses, metal lines, drums, wheel bearings, springs, handbrake cables, shoes, a gallon of fluid used up bleeding a river of fluid, wheels on and off numerous times and still – funky brakes. When a shoe touches only in the middle, when one applies the brakes, the wheel cylinder piston pushes against the end, the shoe bends until it makes full contact. This small amount of bending is travel – which directly translates into travel at the pedal. So the more travel you have at the brakes themselves, the more travel you have at the pedal. Magnify all this travel by 8 brakes shoes – 16 points of travel – one at each end of each shoe, and you might have a pedal that’s nearly on the floor when brakes are applied. But a little space at each end of each shoe is what you want with new shoes. Over time the wear in and become perfectly concentric. Also realize the drum must be flat of from inside to out for proper contact. You can feel this with your finger. A concave, convex, tapered, or deeply grooved surface is unacceptable. A minor groove or two doesn’t condemn a drum. There’s also a maximum diameter for a drum. 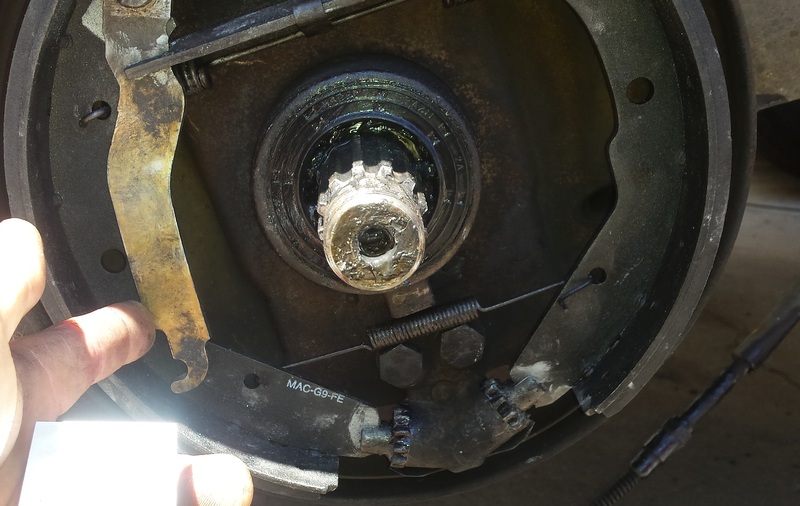 If it’s far beyond the limit, it’s possible for a wheel cylinder piston to come out of the wheel cylinder and cause a massive, instantaneous leak when the brake shoes are far out of adjustment – too much … piston has a limit of travel before it just falls out of the wheel cylinder. If you have your drums turned, make sure to check by looking to see if the machinist turned them deep enough. If not, the shoe may not lie flat. 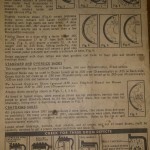 You can tell – look to see if there’s any old wear surface showing at the inside of the drum. If so, they’re probably not deep enough for the new shoes. If you’ve bought new shoes and find they touch at the ends, return them to the vendor and look for another brand of shoes and check again. Shoes that touch at the ends are useless and will barely stop your car and with respect to the front brakes, you’ll get severe pulling and an uneven feel at the pedal. 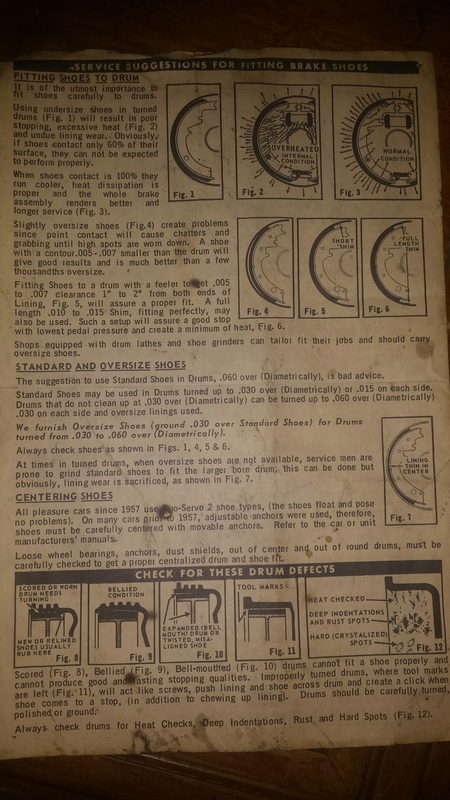 If you cannot find anything that fits properly, you’ll need them “arced” by a shop with a machine designed to grind the shoe to match that curvature (the arc or radius) of your drums. Bit since many new shoes have such thin linings to begin with, you’ll have very little lining thickness left after arcing so it’s not a very good solution. This problem is very common today due to rush to China. The shoes you have that don’t fit right are likely made in China. Just a few years ago, a “new” shoe was really an old shoe with new lining. Thus, the shoe was a genuine VW part. Possibly the mass brake shoe reliners ran out of cores and … cars to reline them for as the population of old VW’s had declined – no demand. Chinese shoes cost about as much now as a set of relined original shoes did a few years ago. Realize, in the world of automotive parts, the term “Brand New” doesn’t always mean better. 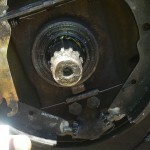 And what’s really amazing it that all the other brake parts one can buy actually fit and work pretty good yet the main part of the system – the shoes – are pretty much junk when it comes to the new ones. That’s pretty bad. As an example, if you had a enough time, with enough trips to the hardware store and an automotive parts store, you could substitute a garden hose for a rubber brake hose. 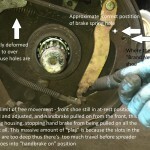 But relining your own brake shoes – probably not. The best shoe to use is a genuine VW shoe that’s been relined. But today, for me, a set of fronts and a set of rears relined by a brake shoe relining company cost 183 dollars for front and rear. They were nice – real thick lining. They still needed arcing, which is practically illegal in California due to the asbestos dust created when arcing the shoes. The reliner did this for me but I had to bring the drums for measuring. Fifty mile one-way trip to the reliner in San Jose, California. Each drum was measured and each shoe was marked so each pair went into the same drum they were measured with. Here’s another massive example of travel found in Chinese brake shoes. These are on the back of a 1978 VW bus. They’re near new but one on the passenger side was nearly worn down to metal due to someone’s desperate attempt to make the handbrake work (cable adjustment too tight causing the shoe to rub all the time thus wearing it out real quickly). There 1/4 to 3/8 inches of space between the shoe and the end of the lever. That’s correct for all models of VW’s with the engine in the back. The slots are just right – almost. After these shoes were installed, I checked for play – travel, which translates to a lower pedal – between the wheel cylinder pistons and the end of the shoes. With the pistons pushed into the cylinder as far as they’ll go, there was a couple of millimeters gap between the pistons in the shoes. Just by filing each spreader bar slot in each shoe a tiny bit deeper solved this and just barely increased the distance between the handbrake lever and the rear shoe as shown in the pic. This is all geometry. A little bit at the slot is a lot at the end of the lever. Don’t over file. Realize then the cable is installed, the lever on the shoe should not be pulled by the cable beyond the position it’s in in the pic. During assembly, if the front shoe moves forward when the cable is attached, the cable is adjusted to short. The correct thing to do is back the cables off when you do any rear brake work so there’s no way the cables are moving the lever enough to move the front shoe, then adjust after the rear brakes are adjusted, and the car has driven and the brakes have been used somewhat aggressively (pushed down real hard). This beds them in. Then, particularly with new cables, adjust them just enough so you can pull the handbrake lever on as hard as you can and as far as you can without reaching it’s limit of travel (I’m talking about the handbrake lever inside the vehicle, just to be clear). Then leave it like that for at least couple hours. Or over night. This seats the cable and stretches new ones. After this, adjust. Bug – 6 clicks at the lever. For bus, about 12 – 15. Realize, the less clicks you have, the less momentum you have to apply it. Close to the dash on a bus is the opposite of right. You can fix a Chinese shoe, however. You’ll need to make the slots 3 – 4 millimeters shallower by filling the end a bit by welding in some material, then filing to fit. Or find genuine shoes and have them relined. However, the shoes above are Bosch shoes. That’s right, Bosch. My local parts store carries both the Chinese shoes and Bosch. This was new to me but I think – hope – the Chinese shoes are going away and Bosch is a newcomer since I’ve always thought of Bosch as primarily a manufacturer of electrical devices. So the easiest way out is to call around and find some Bosch shoes. They’re not much more money than Chinese shoes. But if you’re intent on fixing your Chinese shoes, don’t forget to drill the upper spring holes in the right place. It’ll be a lot easier to put the springs on and you won’t mangle the spring. A mangled (over-stretched) spring is prone to breaking. A genuine brake shoe will have the remnant holes for the rivets that originally held the lining to the shoe itself. Now all shoes are bonded with adhesive rather than rivets. You will not find these holes on a brand new shoe, probably from any manufacturer. Don’t forget to adjust the free play at the brake pedal pushrod too. Too much play here adds to travel and translates to a lower brake pedal. The less free play the better, but you must have some. No free play is like having your foot applied very likely to the brakes all the time. There’s one more place you can find travel you’ll have to wait for it to fix itself. 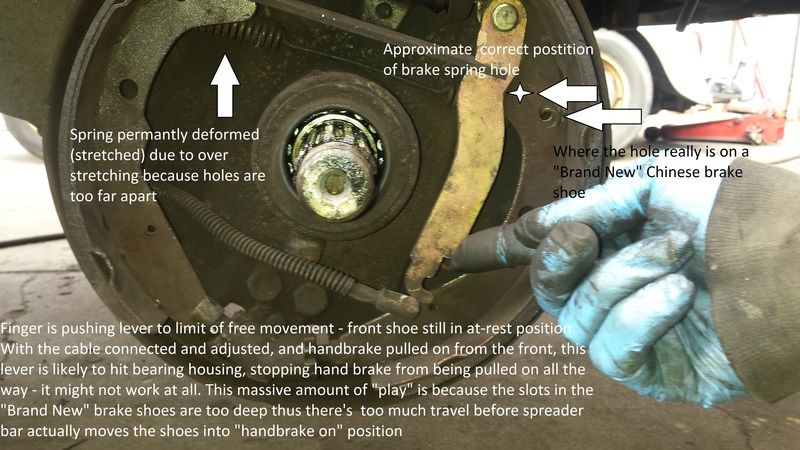 Brake shoes return to at-rest position after you release the brake pedal by way of the springs – the springs guarantee the brakes are all the way off – no drag. For disc brakes, what turns the brakes off? Mainly the absence of pressure applied to the brake pedal. But with new pads or calipers, there’s always a big more travel right after installation than there will be in the future. This is because the caliper pistons themselves have no mechanism to return them to their at-rest position. All we have is the absence of pressure. But the sealing ring for the piston also has an effect on piston return. Right after pads (piston moved into caliper resulting in a new mean position) or calipers are replaced, when the pedal is applied, the piston moves toward the rotor. But it’s not necessarily only sliding within it’s sealing ring. The ring also twists. When pressure is removed at the pedal, the ring untwists and pulls the piston back to it’s mean position. As time goes on (brakes being used over time), the sealing ring allows the piston to move closer to the rotor – new mean – because the piston rests farther along the width of the sealing ring as sliding overcomes twist. At this point in time, the minimum amount of travel exists for the brake pad and thus you have the maximum highest pedal. Everything above applies to all makes of vehicles using Chinese brake shoes. Trial fit and correct as necessary. Same principles apply. No excuses will be made for lack of editing. The info is here and cannot be found in a magazine. Nor are the numerous ads for useless brake shoes along with a myriad of other products that are merely poorly working, if they work at all, facsimiles of the real thing. Donations gladly accepted. And well deserved.